Searching for an awesome crêpe recipe? Look no further. 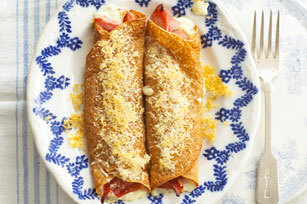 Our baked crêpes with ham and cheese is a winner! Melt butter in small saucepan on medium heat. Whisk in flour; cook and stir 1 min. Gradually stir in milk; cook 6 min. or until thickened, stirring constantly. Add 1/4 cup Parmesan; cook and stir 1 min. or until melted. Remove from heat. Spoon 2 Tbsp. ham down centre of each crêpe; top with about 1 Tbsp. each cheese sauce and mozzarella. Roll up. Place, seam sides down in 13x9-inch baking dish sprayed with cooking spray. Top with remaining cheese sauce and Parmesan.